(a) Remove the 4 nuts and fuel tank protector. (b) Disconnect the fuel tank vent hose hose. Push the connector deep into the charcoal canister to release the locking tab. (c) Disconnect the fuel tank breather tube No.3. (e) Disconnect the fuel tank wire connector. (f) Remove the connector clamp. (g) Set up a transmission jack under the fuel tank. (h) Remove the 4 bolts and 2 fuel tank bands. (i) Remove the 2 nuts. 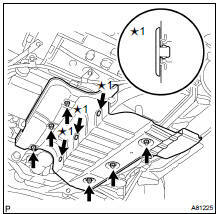 (j) Operate the transmission jack and remove the fuel tank. (a) Disconnect the vapor pressure sensor connector. (b) Unfasten the 4 claws and remove the wire. (a) Remove the tube joint clip. (b) Pull out the vapor pressure sensor. (a) Push the connector deep into the charcoal canister to release the locking tab. (a) Remove the bolt and nut, and then remove the fuel tank side plate and the fuel tank bracket. (a) Push and hold down the vapor pressure sensor. 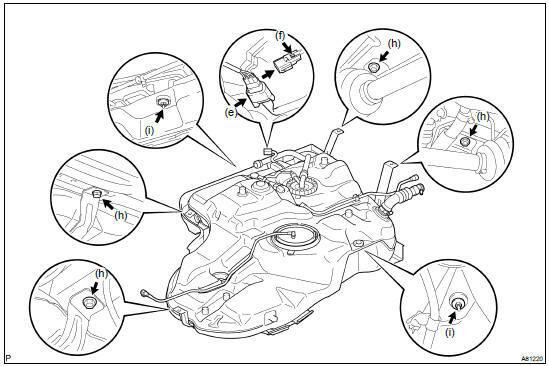 (b) Install the fuel tube joint clip to the sensor. Check that there are no scratches or foreign objects on the connecting parts. Check that the fuel tube joint is fully inserted. Check that the fuel tube joint clip is on the collar of the fuel tube joint. After installing the tube joint clip, check if the fuel joint is securely connected by trying to pull it. (b) Operate the transmission jack and install the fuel tank. (1) Push the quick connector to the pipe until it makes "click" sound. After connecting, check if the quick connector and the pipe are securely connected by trying to pull them.